Paul Rutter Landrovers* offer a range of tyres to suit your driving needs. 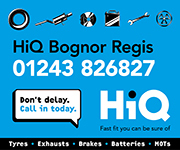 Paul Rutter Landrovers supported by in-house HiQ Bognor Regis, are able to supply and fit your SUV 4x4 with a range of tyres from leading brands including, Dunlop and Goodyear. For further information or to book a tyre fitting get in touch.